Updated. That sound about right? "vibrations within vibrations, traveling at the speed of color"
"I've got a bad feeling about this..."
If you did a direct drive using the 3.6v lithium ion cells, wouldn't it be better to have them in parallel, then no resistor or buckpuck? Yarddog... first of all, you would likely only need a single Li-Ion cell, seeing as it provides 3.7v of power (4.2v on full charge under no load). Secondly, you CAN indeed run without a resistor... but you do need to know what you're doing. For a project where the forward voltage of the LED very very closely matches (or is slightly higher) than the 3.7v Li-Ion cell... you're good--you will not likely need a resistor. However... again... if you DO NOT KNOW what you're doing--always use a resistor. A good example would be a red Luxeon III. It's forward v is around 3v, and 3.7v (or 4.2v) will probably not make it happy... this much voltage will likely destroy it. Finally, regarding a buckpuck... a puck is generally all about "current driving". In other words--it regulates current. Overall, this is better for an LED. A resistor does NOT regulate current. There are advantages and disadvantages to both... like so many other things in the world. Yes, I accept all that as true and good. My question is really (even though you may not need but a single cell) would it hurt anything if you connected two or more in parallel so as to enjoy longer "bright blade" time? The forward voltage shouldn't change so you should be good to go, right? I apologize if my original question was muddled. Oh, and I've seen your site. Good info. Great resource. I'm also building a sinktube saber. I got the 1-1/4 sinktube and i was wondering if that blade holder kit would be able to fit that, the 1.25 sinktube blade holder kit from TCSS. i'm getting a LUXIII royal blue with the resistor and AA batts. I had plans to use the whole sinktube cause it has kind of a cool look to it. 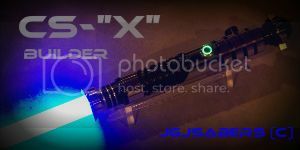 This will be my second saber because i built a pvc saber first to see how it went. the sinktube saber will be better. Also, how would i insert the blade retention bolt on this type of saber? by the wider area of the sinktube? thats where i'm gonna have the blade coming out. like where the twist off part is. the crown. anyway, thanks for the help. I'm not sure what you mean regarding "how" you would insert the blade retention screw. In general, the 1.25" blade holder here @ TCSS (along with Tim's other holders) would simply require you to drill a hole in the side of the holder... then tap the hole (tap = create threading for a screw to fit), do a little sanding to remove rough areas where the drill & tap was done... insert the blade... then tighten the screw. If your blade holder is going to be completely covered by your sink tube... all you need do is drill a hole at the correct position in the sink tube to allow for the blade holder's BRS hole to show through. I got it figured out Nova. I'm just gonna use the sinktube blade holder/heat sink kit from here. it'll be alot easier. and I also thought about giving my saber a "punk" color scheme to it. white p4 led, black switch, and black graflex style grips. i'm getting color filters too and probably will use the purple filter most of the time. cool idea huh? i might cut the side of the opening where the blade comes out at too. what would be the best length of the graflex grips to get? also, i'm gonna be using the resistor in the led kit too since its the correct one. sorry, forgot to mention that part. Does the 2 AA battery holder fit in the 1 1/4" sink tube? I know in the store and tutorial it only mentions the 4 AAA holder as a fitting option. It's a loose fit, but yes.